Eastbound in Diesel territory. Note: Far left center the apparent unit (no roofwalk) and perhaps a elevated crossing signal above it? The radio tower and an overpass in the distance behind the train may help us. Any ideas? I'll have to concur. The Emery map of 1958 indicates a tank car connection (TCC) for the siding. The confusion I had was the turnout leading south with the unit parked with the elevated crossing signal behind it... But... The photo is 1959 and Emery's 1958 map doesn't reflect totally what we see in the photo. I'll have to work on the map for all to review. Thank you, as always. As promised here's the Emery map -Westbury MP22-23 5/1958 - The freight is eastbound over Charlotte Ave. crossing, just west of Hicksville. The overpass in the background is the Wantagh State Pky. Back when Emery drew his maps, this crossing was at grade. It now has a bridge carrying the tracks over the road and the siding is non-existent. Probably done during the grade elimination of Hicksville in 1962. Emery's map indicates a "TCC" at a point along the siding which means "Tank Car Connection," hence the tank car spotted on the siding. What looks like a position light signal with lens shields may very well be an elevated crossing flasher, as I see no other protection for the crossing in this image, other than what MIGHT be a small crossing shanty.. The item far left middle may be the rear of a truck, but... Thanks, MACTRAXX!! Just a little side note: When Hicksville was elevated, they only elevated from about 1/2 mile West of the station to a mile East of the station on both the Ronkonkoma and Port Jefferson branches. Charlotte Avenue wasn't touched during the elevation. It wasn't until after the electrification to Hicksville and Huntington that they decided to eliminate the Charlotte Avenue crossing, which was completed in 1973, due to the increased volume of trains (mainly electrics) that would still fly by not at MAS but about 60-65 MPH. 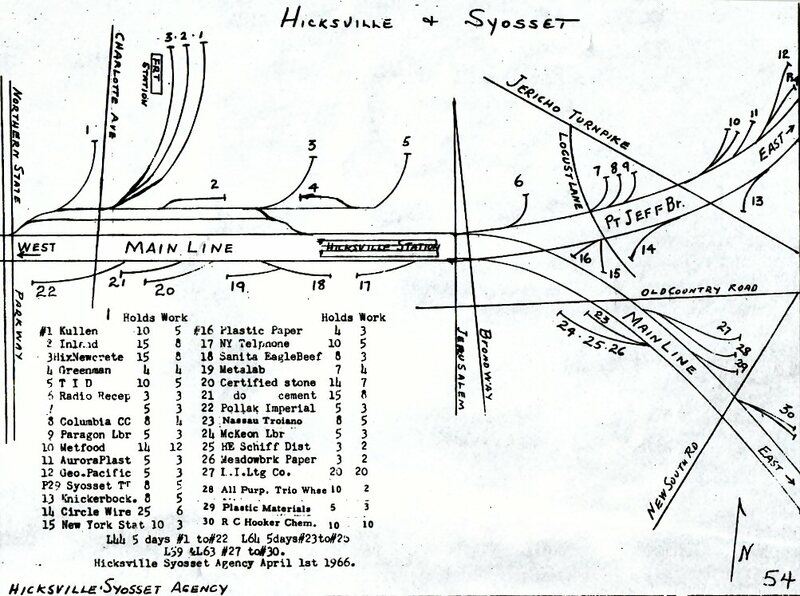 MattAmity90 wrote: Just a little side note: When Hicksville was elevated, they only elevated from about 1/2 mile West of the station to a mile East of the station on both the Ronkonkoma and Port Jefferson branches. Charlotte Avenue wasn't touched during the elevation. It wasn't until after the electrification to Hicksville and Huntington that they decided to eliminate the Charlotte Avenue crossing, which was completed in 1973, due to the increased volume of trains (mainly electrics) that would still fly by not at MAS but about 60-65 MPH. The Charlotte Ave. crossing did have automatic flashers and gates at least from 1960 on. Not sure before that. There was a total of five tracks at that crossing. The two mainline tracks plus the siding pictured above. Then you had another track currently known as "the north side" and another freight yard track also. Head-end View wrote: The Charlotte Ave. crossing did have automatic flashers and gates at least from 1960 on. Not sure before that. There was a total of five tracks at that crossing. The two mainline tracks plus the siding pictured above. Then you had another track currently known as "the north side" and another freight yard track also.